The third edition of Principles of Finance with Excel covers the same topics as standard financial textbooks--including portfolios, capital asset pricing models, stock and bond valuation, capital structure and dividend policy, and option pricing. For each topic, the authors provide step-by-step instruction on how to use Excel functions to help with relevant decision-making. 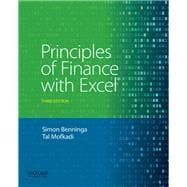 A separate section of PFE (Chapters 21-26) reviews all Excel functions used in the book, including graphs, function data tables, dates, Goal Seek, and Solver. Visit www.oup.com/us/benninga for student and instructor resources, including all the spreadsheets used as examples in the text and in the end-of-chapter problems. The late Simon Benninga was Professor of Finance and Director of the Sofaer International MBA program at the Faculty of Management at Tel Aviv University, a program he founded. Tal Mofkadi is Lecturer at Tel Aviv University and Co-Founder of Numerics Economic and Financial Consulting. He is also a Visiting Professor at the University of Amsterdam, Vienna University of Economics and Business, and Nagoya University of Commerce and Business.